Only a few hours left! Will YOU get to "Run with Ken" for FREE at a race on March 15 in Malden, MA? Every day I run alone. gliding silently over the hills near my home. I love the peace and solitude of these predawn runs. They bring me closer to the sky. and the stars are my guide. into the energy and life of a RACE! We flow over the hills and flood the streets! and form friendships that last for years! But on February 15, I need YOUR help! It's a 5K race in Malden, MA. ...or wine if you prefer. 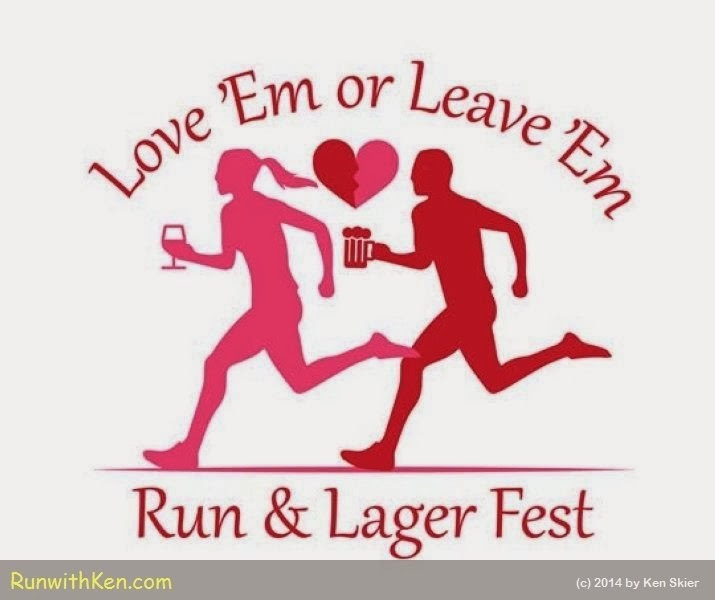 The Love Em or Leave Em Run is designed for couples. Maybe friends, family, or neighbors. Doesn't matter what kind of couple you might be. But the whole theme is Teams of TWO! Or each of you might run at your own pace. Doesn't matter. You're a team. Your finish times will be added together to get a team score. enter the following quiz, and submit the correct answer. one of you will get to run this race for FREE! You don't have to run with me. But I will do my best to get a photo of YOU as you run. I will only consider your final entry. is on Feb 15: one day after Feb 14. Please submit your answer in a comment below.